Budget Travel Guide South Korea: Happy Parents' Day! Hope everything is going fine with life, love and health. I wanna wish every parent out there Happy Parents' Day! Cause today, 8th May 2011 is the day for parents. 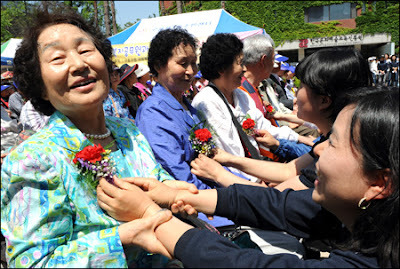 I had celebrated the day back in 2010 with Min Young's grandparents by going to Paju in a typical bright and sunny spring day. Arghh..really miss those memories. Wishing every parents for health and happiness. ^^ Although saying thank you is measly but from the bottom of my heart, to my parents and other parents as well; thank you so so so much for nurturing the future generation of our world.